Each level is procedurally generated, and so each playthrough has a unique environment and challenges. The player's goal is to search and activate all the marks placed in each level to unlock the dungeon and hopefully escape. However, players will encounter different obstacles in the labyrinthine dungeons. Players can collect various items and upgrades to counter the dungeon's dark forces. 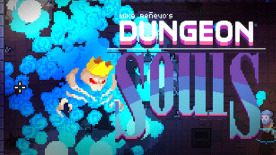 Some elements in Dungeon Souls were inspired by Nuclear Throne, Risk of Rain, Overture, BitVenture and Shoot First.